Ken Phillips is an International multi-media Artist whose Art can be found in over 5500 homes, businesses, restaurants, Universities, and galleries worldwide. 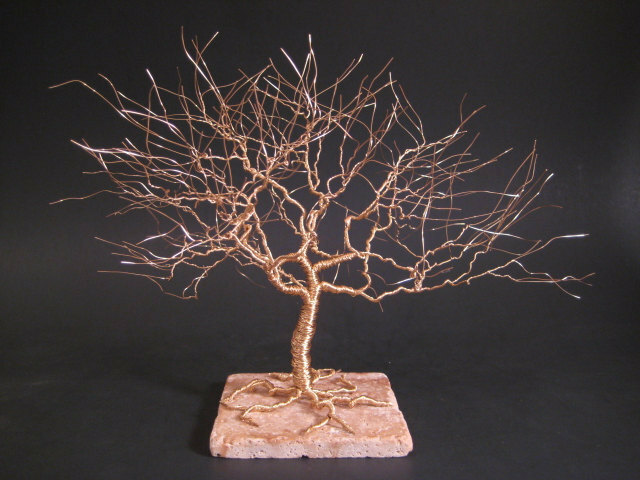 This gold tree of life wire sculpture will make a great anniversary gift especially for a 50th celebration. 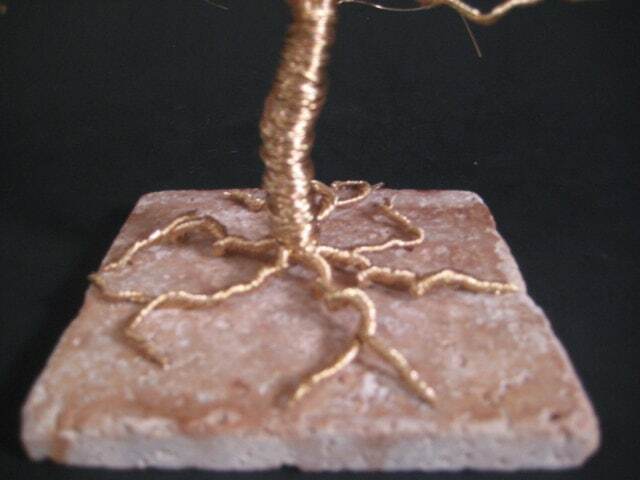 It will be made from hundreds of wrapped and twisted tarnish-resistant wire resulting in a one of a kind creation. Hand wrapping takes longer but it creates the realistic effect of a tree's natural trunk. We don't know how to express how grateful we are for your accommodation to our simply ridiculous deadline request. The beautiful tree made it to Nebraska in tip top shape. The pictures don't do your work justice! Such delicate work it is just enchanting to look at. We're sure Mom and Dad will appreciate the way you capture such personality in the piece also. I will most certainly consider another purchase from you and keep your items in mind for future gift needs. Just one follow up Ken... My in laws absolutely love the tree. Their open house was this past weekend and we asked them to open the gift before the guests arrived. There were tears from both of them and the tree instantly became part of the centerpiece with their wedding and anniversary pictures. The beautiful creation lives as a prominent piece in their den where they spend their down time. They love it and your work. Thank you again. You made it happen and provided such a unique and special gift. It can be difficult to buy something for those that seem to have everything. Haha... The tree was a perfect piece of art for the occasion. 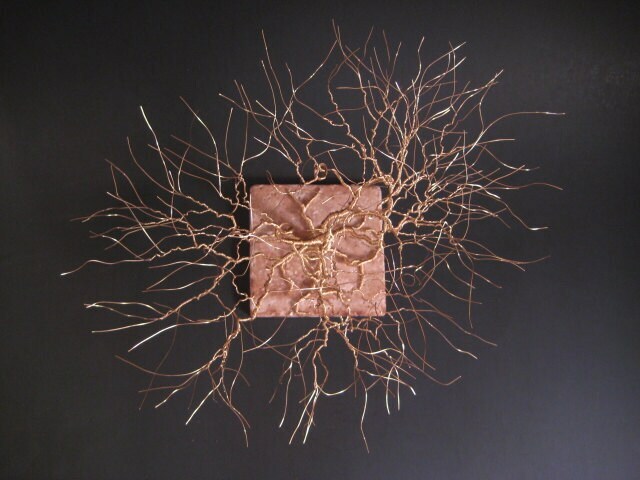 The dimensions for the tree pictured are approximately 8" tall x 9" wide x 7.5" long. It sits on a base of tumbled marble that has been left unfinished. The result is a very detailed piece of wire art. 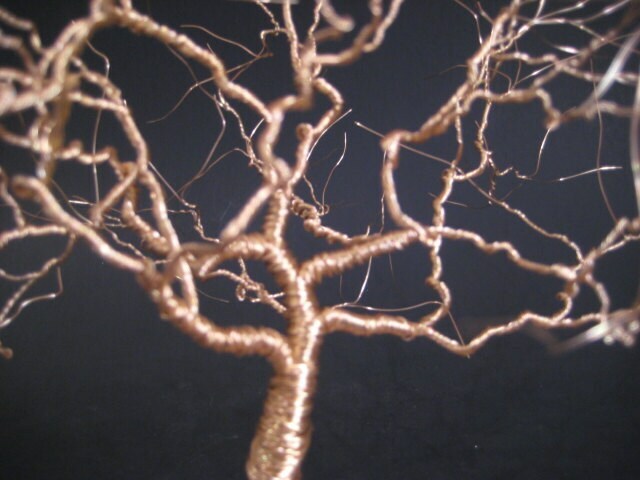 The smaller tree comes with the same number of wire strands and actually has more fullness in appearance than the larger tree. The larger tree is pictured in this listing. If there any issues with your order, please make sure to use the Etsy conversation ("convo") feature for communication. Using the "Contact" feature will not guarantee that I will see your message. International buyers are responsible for all additional customs, value added tax, fees, etc assessed by home country. Natural wood needs to breathe. Please remove your ring box from the packing paper and box. Please leave out in the open but not where it will have contact with dry, central heat. Ken was very responsive when I contacted him regarding the purchase of an 8” 50th Anniversary tree for approximately $145 including shipping. I loved his unique idea and couldn’t wait to purchase one for my brother and his wife. However, when my brother sent a picture, the tree was noticeably less dense than the one shown in the website picture. I reached out to Ken to let him know my concern, hoping we could resolve. I have had no response from Ken. I would not recommend this vendor due to his lack of concern for customer satisfaction and the fact that he sent out a less than satisfactory product. This piece is gorgeous!! It was brilliantly packaged to survive the journey from Arkansas to Oregon and is simply breathtaking. I hope my parents love it as much as I do! Thank you so much! I had no idea how masterly crafted and absolutely beautiful this would be. I ordered the largest size on a dark gloss stone bottom, and I am beyond amazed. It truly is a work of art, and an inspiring piece to have. If I could give this more than 5 stars, I would. Highly recommended. Very pleased with the approx 8" Tree of Life I ordered for my husband! He was definitely surprised and really liked it! !